This week, Walgreens announced a massive partnership with Microsoft, raising a number of questions about Microsoft's potential impact on health care. At face value, the deal strategically positions Microsoft to compete with the other tech giants eying the untapped health care market—beyond its current products. 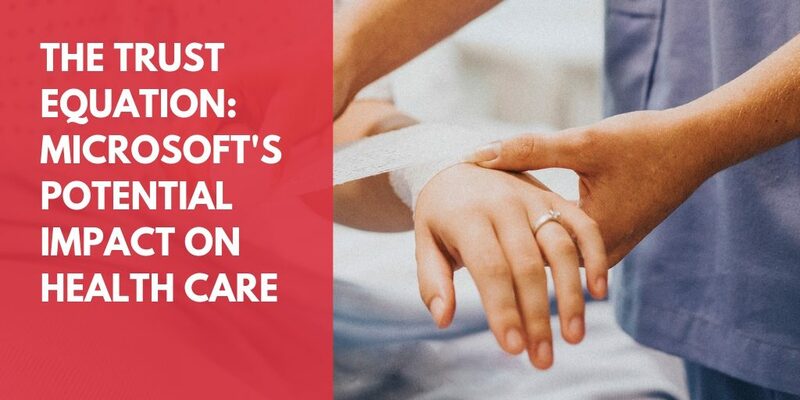 Furthermore, the announcement also highlights Microsoft's unique value proposition to health care providers—one that could shape the future of how health care is delivered. Firstly, I have to apologize. My three previous blogs regarding industry impact on health care examined, in part, the potential impact of the three As—Amazon, Apple and Alphabet (Google)—but ignored the massive tech elephant in the room: Microsoft. As my excuse, I'll say that Microsoft's reputation as an innovator and leader suffered in recent years as on-lookers suggested the company was spread too thin, bloated and using bullying tactics to make profits rather than technical prowess. But news that Microsoft retook the title of Most Valuable Company from Apple in December, a title it hadn't held since before the 2000 dot-com bust, highlighted its "clear vision and aggressive sustained growth" under CEO Satya Nadella. (Though, Amazon retook the top slot, again, recently.) Much of this growth has come from its cloud computing and artificial intelligence software business, where it's quickly competing with the already massive Amazon Web Services. We're focused on Microsoft's potential impact on health care, but notice how the financial news makes a big deal of Walgreens' commitment to Microsoft 365 and Microsoft's Azure cloud deployment? That's a big enterprise win for Microsoft. The point is, Microsoft has flipped the script and reclaimed its reputation as an innovator and leader. Its rapid-growth focus on cloud computing have put the tech giant back into the conversation with the three As as a mover and shaker. And while its focus moves away from the Windows operating system, Microsoft can still leverage that market share dominance, and the ubiquity of Microsoft's Office productivity suite, to an advantage over the other guys: in security, ease-of-use and trust. "Hospitals are moving to the cloud, but worries remain," reads a headline from last May in HealthcareDive. There's growing interest in moving server infrastructure to cloud services, where organizations can cut costs on data centers and also take advantage of existing data analytics applications or build their own custom solutions with greater agility and scale. The cloud also allows access to data from anywhere, better facilitating outpatient care or interface with real-time patient data. However, according to the survey data, worries about security and compliance in the cloud remain. In some respects, these worries are misguided. Most experts agree that "moving to the cloud is a step up for security," according to an October story in Mobi Health News. Infrastructure-as-a-service providers like Amazon and Microsoft can provide regular updates, real-time monitoring and dedicated security resources that the IT departments of even the largest hospitals can't match. Ultimately, it's about trust. That's one area where Microsoft shines for the highly regulated health care industry. "Microsoft is already a trusted business partner for the health care industry," reads a sponsored April article in EHR Intelligence. The ubiquity of the Windows OS and Office productivity suite make cloud migration easy. And hospitals can be sure that their Windows-based EHR applications will work with Microsoft's cloud. "Fortunately, the one thing that truly works perfectly with Microsoft is Microsoft," says Insight Cloud Solutions Specialist Mary Ann Pitts. "It's intended to work with the EHR system and ensure compliance." If Microsoft can leverage its unique advantages in the health care industry to gain market share dominance over Amazon and other competitors in the cloud space, the company could wield a tremendous amount of influence over electronic health records and their use. It's not out of the realm of possibility to think that Microsoft's market share could look a bit like its virtual monopoly on productivity and operating systems, at least in health care. And that leads us to a greater realization: Microsoft's potential impact on health care could be absolutely huge. Circling back to Walgreens, this massive enterprise deal provides us with deeper insight on how Microsoft could affect the way health care gets delivered. In my previous blogs, I've discussed how CVS-Aetna and Walgreens-Humana partnerships could greatly expand investment in retail primary care. 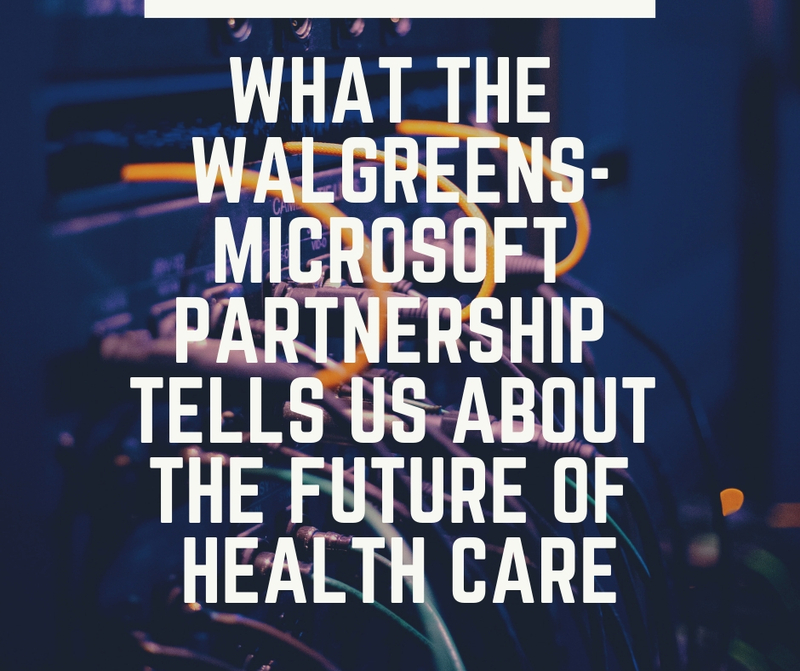 This Microsoft partnership is another signal from Walgreens that they are preparing their tech infrastructure to scale rapidly and compete with CVS-Aetna investments in convenient care and population health. But it's not just that Microsoft infrastructure will be indispensable in storing and securing sensitive health care data—Microsoft will also be developing artificial intelligence applications to help organizations analyze that data and even products to help them collect that data. A Kalorama Information report from last June found that Microsoft filed 73 patents from 2013-2017 based on expanding its AI capabilities and developing monitoring devices for chronic diseases. Two questions summarize Microsoft's potential impact on health care. How much influence will Microsoft wield, and how rapidly will health care delivery change? It all comes down to trust. To the first question, the advantages Microsoft wields over the other cloud storage companies should not be underestimated. Ease of migration, and the natural compatibility of Microsoft infrastructure with other Microsoft products results in a great deal more trust than simple brand recognition. Though, they have that recognition as well, and the end-users, providers and consumers, are already familiar with Microsoft systems. It seems like we've heard a lot more hype out of Apple, Google and Amazon, but Microsoft is a natural big tech partner for the health care industry. While they're directly up against Amazon in cloud storage and AI, and Apple in consumer health products and data collection, I think we can expect Microsoft to leverage trust to a significant market share. To the second question, I return to a familiar refrain from my previous blogs. With all the big tech players looking to health care for rapid growth potential, expect the industry to change more at the speed of the tech industry, not the traditional speed of health care. I've argued before that the cost of care is enough of a burning platform to lower resistance to change. Especially for Microsoft, trust could be a major factor facilitating the lowering of barriers. But ultimately, rapid growth potential for the U.S.'s largest public corporations is enough cause for them to fight their way through whatever barriers remain. With a new congress and Democratic control of the house, a lot of the health care news has been focused on potential legislative shake-ups and large-scale reform. It's on my radar, and I'll be taking a look at some of those ideas in a later blog. But frankly, we know reform is a slow process. And health care is poised to change drastically—not due to legislators, regulators or even providers. Health care is poised to change due to investments by industry—the largest corporations in the world all turning some of their focus to an area where they can cut costs of employee health insurance and tap into potentially rapid growth in a huge and growing consumer marketplace. That’s why industry impact focuses our Spring conference in Cincinnati. Industry impact on health care will be significant, and change will happen fast. HPN seeks to stay ahead of the curve on behalf of our members and our members’ members. Join the Health Professions Network at our April 3-5 conference to make in-roads on these industry developments, and learn how these massive trends may affect your profession—in the immediate future. We can guarantee you’ll leave with practical takeaways to guide your organization’s strategy and make a greater impact for the professionals you support. Don’t forget, as a Health Professions Network member, you’ll receive an immediate discount on registration fees for our Spring conference. Learn more about how membership in the Health Professions Network can benefit you and your organization, here. Membership in the Health Professions Network will not only keep you on top of trends affecting health professions, like industry impact on health care. Membership will also connect you to a supportive, caring network of professionals involved in associations, accrediting agencies, certification bodies, educational institutions, workforce analysis, and more—all focused on supporting allied health professionals. Joining HPN will also ensure that your profession’s voice is represented in the important care discussions to come. The Health Professions Network (HPN) is a nationwide collaborative group of organizations representing leading health professions associations, accrediting agencies, and educational institutions, as well as federal and state workforce analysts and licensing and certification bodies.